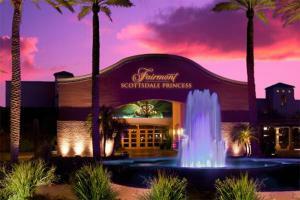 Experience the ultimate in luxury at the AAA Five Diamond Fairmont Scottsdale Princess. Set against the backdrop of the Sonoran Desert, the resort’s vast open spaces harmonize perfectly with the magnificent surroundings. 750 plush guest rooms, including suites and casitas, offer an idyllic retreat with Southwestern décor accents, oversized luxury bathrooms and terraces. With six sparkling pools, a full-service spa and two 18-hole championship golf courses, the resort offers every opportunity to follow your bliss. The resort is located in Scottsdale, approximately 24 miles from Phoenix Sky Harbor International Airport. La Hacienda by Richard Sandoval - Mexican cuisine; Bourbon Steak - contemporary American cuisine; Toro Latin Restaurant & Rum Bar; Ironwood American Kitchen - breakfast and lunch; Plaza Bar. Cosanti - Paolo Soleri Windbells; Desert Botanical Garden; Old Town Scottsdale; Bondurant Racing School; Rawhide - Western town replica; Sonoran Desert trails.